When you are dealing with painful and uncomfortable symptoms, the first instinct of many is to head to their medicine cabinet, and who could blame them? When you feel like you can’t breathe, have a pounding headache, and have no sense of taste and smell, it is probably accurate to say that you feel miserable. The worst is that these symptoms can stem from the flu, sinusitis, allergies, or even the common cold and the suffering is the same all the way around. With colder day’s right around the bend, there is likely to be an increase in these symptoms, but who wants to take over-the-counter drugs regularly? Many don’t realize that there are foods for nasal congestion that can be consumed to offer some relief, naturally. 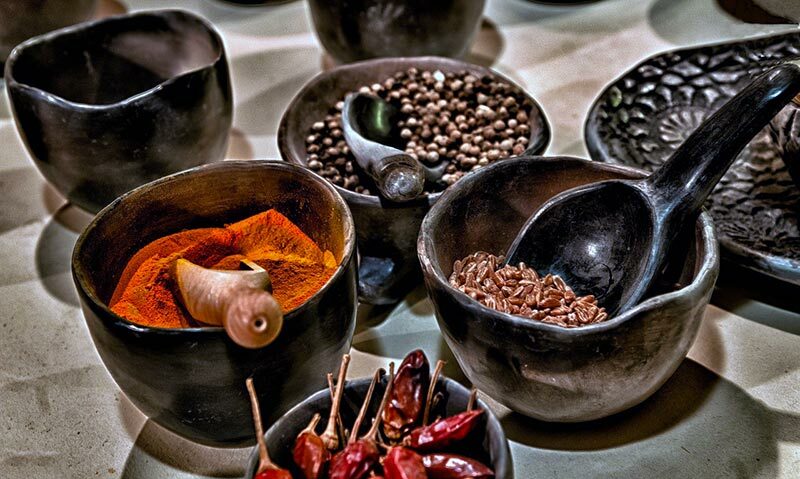 If you want to ditch the nasal sprays and are looking for a more natural approach for temporary relief, check out some of the best spicy foods for nasal congestion. One of the most potent decongestants on this list, horseradish is not for the faint-hearted. Horseradish, while powerful and often causes a tingling sensation in your nasal area, can offer fantastic relief and you don’t even need a lot! This root is full of minerals and anti-oxidants, so its benefits go past instant relief. For sinus relief, make horseradish a more regular part of your diet. This fragrant root is known for its antibacterial, anti-inflammatory, and pain killing properties. Ginger is an excellent choice for a host of ailments, including coughs, sore throats, and nasal congestion. Use this spicy rhizome alongside your favorite foods, or boil ginger in water to make a warm and soothing tea. Don’t forget to inhale the steam from the tea, as the warmth and steam will help relax and decongest your sinuses. Onions are undoubtedly spicy and pungent, even when you are not consuming them. Just peeling and slicing an onion makes your eyes water and can help drain your sinuses. Within onions, natural antihistamine properties are contained that help reduce inflammation and congestion. For natural relief, add onions to your salad, sandwiches, salsa, and to your favorite recipes. Consuming this delicious condiment is an excellent way to relieve sinus congestion, and the browner and spicier, the better. This medicinal spice will not only help drain blocked sinuses, but it is also chock full of minerals, anti-oxidants, and vitamins. So enjoy this spice on a spoon, on top of crackers or toast, or add it to your favorite dish. If you’re not into very spicy foods, radishes may be right up your alley. Not only are they delicious when eaten raw (especially when dipped in hummus), but the spice is much milder than some of the other items on this list. To top it off, radishes are rich in Vitamin C and contain antibacterial and antiviral properties. So grab the hummus and the radishes, and go to town. If you are addicted to spice and can’t get enough of it, chili peppers are for you as one of our suggested spicy foods for nasal congestion. Also, capsaicin, a natural pain reliever, can be found in chili peppers. So if you like the extra punch, eat chili peppers raw, out of the jar, in salsa, or in your favorite recipe. Garlic, when you crush or chop it, releases an enzyme that produces allicin, which may help you eradicate viruses and bacteria. So make sure you let your garlic stand for 10 minutes before you eat or cook with it. The sky’s the limit with garlic, add it soup, salad, dressing, or to your favorite dish! Please remember that this list of Spicy Foods for Nasal Congestion is meant for temporary relief, they do not replace seeing a doctor. If you are experiencing a great deal of discomfort, or are unsure in any way, be sure to consult with your physician.